Throwback Thursday: Dio's "Dream Evil"
In September of 1987 Dio released their long-awaited fourth album, and the first not to feature original guitarist Vivian Campbell. It is another of those albums that heavily reminds me of my school days, in this case the finale of Year 12 and the Higher School Certificate. It also reminds me of the school holidays that came before that, and my 18th birthday. I was on a family holiday in Coffs Harbour with my family and the families of my Dad’s two brothers, a week long sojourn that highlighted by almost everyone coming down with a 24 hour stomach bug which included vomiting and other such fun stuff. Dad was about the only survivor of this, with his technique of keeping his bodily fluids up throughout (ie a constant beer drinking regime) in order to stop the bug attacking him. Well played Dad. As I had bought the album the week before we went, I listened to it incessantly on this trip, and it always reminds me of that time (as does anytime I watch 'Three Amigos'). Moreso it brings back those fun days at the end of our school time in Year 12, and the HSC as well. I still remember vividly on the anointed ‘muck up’ night, where we gained entry into the school hall an spent the evening… playing up. At one stage during that evening, a group of us, which included Kearo, Dale, Bono, Joel, Brett Doney and Lewis Norman stood around singing (probably badly, but who was to know) this whole album out loud as it played through someone’s tape deck. This was followed by Kevin Pepper’s marvellous speech about the Australia Card, and the screaming of the cleaners when they arrived to witness the carnage at some stage early that morning. Great memories. 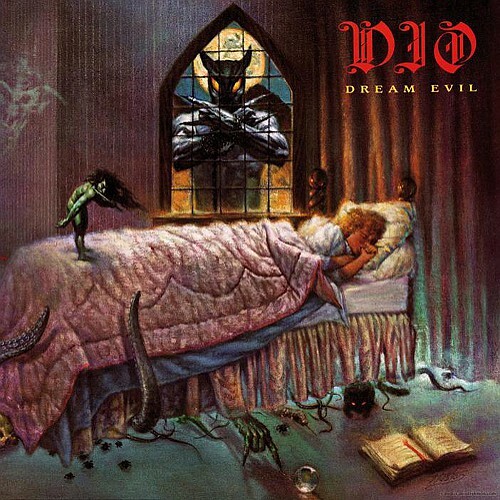 Dream Evil is a much maligned entry in the Dio catalogue. It may have dated somewhat since its release, but to me it still carries a punch with songs like “Dream Evil”, “Sunset Superman”, “All the Fools Sailed Away” and “Faces in the Window”. The great man’s vocals certainly don’t disappoint.